Actor Kimberly Brown, star of the 1998 Disney TV movie, "Halloweentown" and a popular fixture at the city of St. Helens' annual Spirit of Halloweentown festivities in October, will be skipping this year's events — the result of deteriorated contract negotiations and an acrimonious rift between the city's contracted event coordinator and Brown's talent agency. Email records, released by the city of St. Helens at the Spotlight's request, indicate Brown's agency, Gemstone Talent, has had a falling out with the city's contracted event planner, Tina Curry. Curry, or "Cannard" as her last name appears on some documents, runs E2C Productions out of Vancouver, Wash. The emails show that Gemstone accused Curry of spreading erroneous and false statements about Brown, not communicating honestly with city staff about expenses related to the celebrity talent at Spirit of Halloweentown events, and engaging in personal feuds with business owners and community members that negatively affected Brown's image and reputation. Gemstone Talent's legal staff on Aug. 6 sent a cease and desist notice to St. Helens Mayor Rick Scholl, City Administrator John Walsh and St. Helens City Council members alleging the city engaged in misleading, ambiguous advertising regarding Brown's appearance at this year's festivities and has made statements that harmed Brown's reputation. When contacted about this story with a request for comment, Curry said the city has moved on and the Brown discussion is in the past. "We have moved on. We would still like Kimberly to return in the future, but the Council would likely not be able to approve it if the cost is high. That's the future, this is now. How long are you going to beat this dead horse to try and sell a paper?" Curry stated, in part, in an email to the Spotlight. Many source documents cited in this story, including two different email chains can be viewed here and here. Email correspondence shows the city balked at contract requirements outlined by Brown's agents to guarantee the "Halloweentown" star's appearance at this year's festivities. Diane Yslas, president of Gemstone Talent, outlined a $30,000 flat guarantee for the city to secure Brown, a $2,000 down payment, a 15 percent brokerage fee, a $60 per diem and first-class travel arrangements, among other payments — a proposal Yslas maintained is consistent with receipts generated from Brown's involvement at prior Spirit of Halloweentown events, the emails show. The city calculated the cost at roughly $40,000 and counter-offered, which Yslas ultimately rejected as a "low ball" offer. "In this 20th Anniversary year, where the potential is for record-breaking crowds, this is not an offer we can agree to," a Gemstone rep's email to the city shows. "Our offer is based on a solid track record that has consistently exceeded expectations. The guarantee is based on approximate receipts from years' past; and with an additional event day, it is more than easily reached." Curry, in a June 29 email, stated her concerns to city councilors, cautioning them to "be worried they want a guarantee – for a celebrity at her level – this is an absurd request and why?" The St. Helens City Council members reached a consensus through email exchanges, without meeting publicly, that the requested dollar figure for Brown this year was likely better spent elsewhere, according to email documents. The sought-after fee for Brown is exceedingly higher than when she first came to St. Helens in 2015. Per a Spotlight records request, the city revealed that Brown received $3,500 in compensation for that appearance. The following year, the city refused to disclose the information, citing backlash from Brown's agent at Gemstone Talent about the published figure. The released emails show Curry, with the city's complicity, specifically maneuvered to keep payments of public dollars to Gemstone Talent and Brown a secret. To do so, the city made bulk payments to Curry's business, E2C, which were then funneled to Gemstone Talent and Brown. Several times during the email exchanges Curry cautions and seeks to advise Brown's talent agents against including City Council members in the email discussion in an effort to keep city spending a secret, noting that including city officials could prompt a legal release of the records should they be the subject of a public records request, as the Spotlight ultimately pursued. Gemstone, however, routinely insisted on written correspondence. Curry noted in other exchanges that she had withheld certain details of the contract agreements from city staff to prevent information from being publicly obtained. "The City has had zero knowledge of what she gets paid so that when the press asks them they can honestly say that she is contracted through another company and we are not a public government office so we don't have to disclose it," Curry noted in an a May 14 email. Curry has consistently maintained that Gemstone required Brown's compensation be kept confidential. Curry, after lengthy correspondence with Gemstone reps who accused her of bad faith negotiations, advised the city against hiring Brown back, including pointing out to councilors the public backlash they would face if the expense for Brown became public. "If we were going to spend $40K we could get someone that is nationally recognized. We have built Halloween to such as degree that I don't know that Marnie is 'adding' that many extra people we already wouldn't get," Curry wrote in an email to St. Helens city officials, including the City Council and Mayor Rick Scholl. Curry added, "For that kind of money we could get some Twilight people, I imagine." Other actors from the "Halloweentown" film, including Judith Hoag, Joey Zimmerman, Emily Roeske and Robin Thomas, are scheduled to appear at this year's Spirit of Halloweentown. There will also be appearances from actors Reggie Lee and Sasha Roiz from the TV series "Grimm," which was filmed in Portland. Some of the sparring between Gemstone and Curry appears to originate from Curry and the city's quarrel with St. Helens Economic Development Corp., a merchants advocacy nonprofit serving St. Helens. In the same series of email correspondence in June, Curry faults Amanda Normine, SHEDCO's vice chair, as the source of the city's split with Brown and her agents. The conflict between Curry and SHEDCO seems to have developed after Curry opted not to include two SHEDCO events on the master list of Spirit of Halloweentown activities in 2017, one of which included a meet-and-greet with Brown at a filming location featured in the "Halloweentown" film called "Aggie's House." Curry flatly rejected Normine's pitch for the event, instead telling Normine that if she wanted celebrity participation, she would have to get it on her own. "If you want to plan anything you can. If you want to hire a celebrity you can. I think it was pretty clear you can send us all things Halloween that you have planned and we will put it on the agenda," an August 2017 email from Curry to Normine notes, which is echoed in an April 27 email from Gemstone Talent to city officials. In April, the city, through Curry, attempted to extract an exclusivity agreement from Gemstone that would have prohibited Brown's involvement at SHEDCO-proposed events. "Your personal bias against the SHEDCO board, as expressed to this office last fall, then followed by multiple roadblocks erected to discourage SHEDCO's participation, raises a glaring red flag here that is contrary to good faith negotiations," an email from Yslas states. "Regretfully, your request for exclusivity speaks more to a personal agenda and/or a proverbial axe to grind, rather than supporting the City's mandate to serve all its citizens and the council's sentiment to honor our client, which has included giving her a Key to the City." Gemstone indicated in an April 27 email that the agency was willing to continue negotiating with the city at that time if it could patch up the relationship with SHEDCO. That never happened. 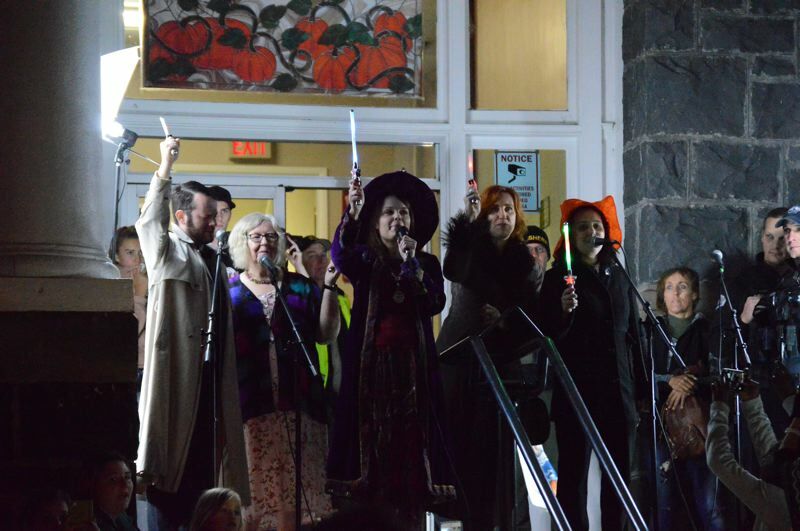 Brown has been a fixture at the Halloween-themed festival since 2015, when she announced her intent to travel to St. Helens over social media and was greeted by a crowd of more than 5,000 who watched her light the city's ceremonial pumpkin, signaling the official start of the month-long festival. 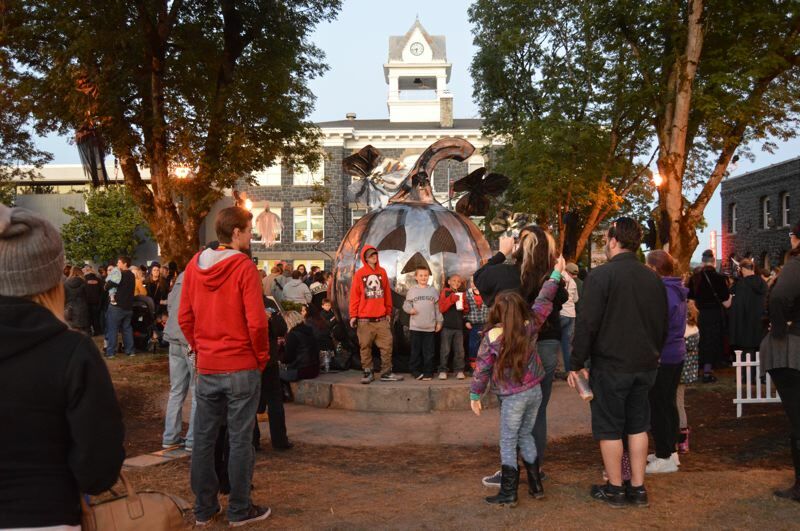 The original "Halloweentown" film was shot in St. Helens, and the announcement of Brown's first visit generated a viral media frenzy of fans eager to see the former teen actor grown up and returning to the film site. City staff reported thousands of new website hits and requests from national media outlets and magazines when the news spread. St. Helens was inundated by thousands of fans eagerly packing into Columbia Courthouse Plaza and spilling into streets on the Riverfront District to welcome Brown. In the years following, the fanfare continued to grow. The city invested in decorations, props, host talent and more. Funding has primarily come from the city's visitor and tourism fund, which is supported by transient room fees paid by hotels and motels. The city has defended the spending as revenues have also grown, but has never kept an itemized list of invoices or asked to review reimbursement requests made by Curry and E2C. Through public records requests, the Spotlight received a list of expenses related to prior Spirit of Halloweentown purchases and spending, but invoices while itemized in many cased, do not include specific items or services purchased. Finance Director Matt Brown previously said that the city has never asked to review invoices or reimbursement requests made by Curry. Brown has become increasingly involved in the month-long festivities, expanding her weekend-long appearances to include photo ops, fashion shows, costume contests, cocktail parties and more. Last fall, Brown was joined by a host of other actors from the film, including Judith Hoag, Zimmerman and Roeske, to host a special tribute for late actress Debbie Reynolds, the grandmotherly witch, "Aggie," in the Disney production. Some of those are returning this year. Curry maintains she is working diligently to deliver a quality Spirit of Halloweentown experience for visitors. "I'm going to work to try and give people a reason to come to Spirit of Halloweentown," she stated in an email to the Spotlight. "I am encouraging people to visit that might want a cool, fun trip to a place they likely had never heard of before now that enjoy Halloween Activities." Editor's note 9/17/18: This story has been updated to include more source documentation regarding financial statements made in the initial reporting. The story has also been published to include a clarification that the city does maintain a series of invoices which are itemized for reimbursements paid to E2C, however those invoices do not include specific information about purchases or spending at times.